The estimating service wrote in a news release that CCC Smart Total Loss could be distributed to policyholders as a separate app or built into an existing insurer smartphone program. 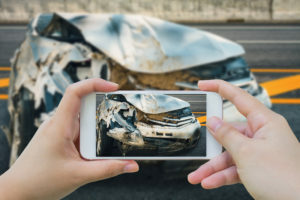 AI photo estimating firm Tractable, which partnered with Mitchell last year, has observed that insurers are sitting on a “gold mine” of estimates tied to images of cars after a collision — precisely the kind of fuel needed for teaching a computer to analyze the meaning of such photos. Estimating services have a similar “gold mine”; a CCC executive noted Monday that the information provider had a database of 180 million claims (though presumably not all of them have photos), and more are coming in daily from CCC ONE’s more than 350 carriers and 24,000 shops. Unlike Mitchell, CCC built its own photo-estimating artificial intelligence, according to an executive. “CCC has made significant investments in AI-related technology and human resources, including a dedicated team of PhD.’s, data scientists, computer vision and machine- and deep-learning experts,” CCC product management Senior Director Chirag Shah said in a statement. “This groups works alongside our R&D team that includes a large group of individuals with tech experience, and deep industry, customer, and product knowledge. CCC’s AI-related efforts have been persistent and ongoing for nearly a decade. Shah said pairing CCC’s photo estimating capabilities with its predictive analytics would be a natural step. CCC’s Drive uses data generated from within the vehicle during a collision to estimate factors like the location and severity of the impact. CCC has discussed the idea of triaging total losses based upon this alone, and it seems like combining this with photos would make for even better predictions. Collision repairers have rightfully expressed concern about the amount of damage invisible to photo estimating, and the issues persist whether the analysis is done by a computer or traditional desk reviewer. However, CCC Smart Total Loss might be a less controversial offering given what’s likely fairly obvious damage already on the vehicle and the battles some shops have reported trying to convince an adjuster a car’s totaled. CCC describes Smart Total Loss as the start to a suite of touchless claims offerings known as CCC Smart Claims. CCC has described its telematics triage system as available to shops, and it describes the Smart Total Loss photo AI as part of the CCC ONE suite available to shops. This suggests a benefit to a shop besides not having one’s time and repair bay profits curtailed by clearly totaled cars being brought in from repairs. Say an adjuster not equipped with CCC Smart Total Loss refuses to declare the clearly totaled car taking up valuable space in your shop a total loss. Could a shop with CCC ONE feed a photo of the car into CCC Smart Total Loss and get a second opinion before having to prove the point with a teardown? As we discussed with Tractable, estimates based upon past data could be problematic if ignorant or cost-cutting shops failed to provide a second opinion on an insurer’s estimates or underrepresented the amount of work truly demanded by OEMs on the supplements that were filed. Get enough of these lowballed estimates into the database, and the computer will draw upon that knowledge base to unknowingly lowball future claims. We asked CCC about whether it had limited the data to supplemented estimates or if it had included single-estimate claims. This consideration still seems to put the the impetus on shops to accurately estimate and supplement claims to perhaps further refine what the AI sees as a totaled car (particularly as more doors, hoods and bumper beams go aluminum and tech increases) or the machine learning related to the rest of CCC Smart Claims. Think about the debates and complaints on social media over how an estimator missed tens, hundreds or even thousands of dollars in damage and legitimate, necessary repair procedures. (As opposed to bill padding, which is wrong, illegal, and likely to be caught by other forms of insurer AI anyway.) If those shops continue to miss or intentionally omit that work on their estimates and supplements, the computer will learn the wrong lessons from their collective output. Complicating life for the AI as well as shops would seem to be the changing vehicle technology, both in terms of electronics as well as substrates. Just as shops familiar with steel F-150s had to learn how to fix an aluminum one, it would seem as though a hypothetical AI in 2015 would have had to unlearn some of what it thought a totaled F-150 looked like and determine a new threshold for an aluminum version of the truck. We put this question to CCC as well.